This is the introduction for Kendrick Lamar's "The Heart Pt. 2". Here, Kendrick takes an interview clip in which photographer and New York based artist, Dash Snow, is asked what keeps him alive. Behind Dash's response we hear the beat slowly and softly build; the instrumentation is an extended version of The Roots "A Piece of Light". Immediately after Dash gives his somber answer, Kendrick Lamar starts his verse with a "thank you" for the honesty of Dash's words. Dash Snow died of a drug overdose in 2009. "The Heart Pt. 2" was released in 2010, appearing on Kendrick Lamar's fifth mixtape, O(verly) D(edicated), also known as “OD”. Since that very moment, Kendrick Lamar has been my favorite rapper. Growing up in Los Angeles, I was an outsider when it came to my tastes in hip hop. I would listen to 92.3 The Beat, where the playlist was dominated by west coast g-funk and gangsta rap: Tupac, Dr. Dre, Snoop Dogg, DJ Quik, Warren G, Kurupt, Nate Dogg, Ice Cube. Everyone of these artists are great and have given us incredible music. But my ears craved all things east coast; A Tribe Called Quest, Wu-Tang Clan, Black Moon, The Fugees, Slum Village, The Roots, Mos Def & Talib Kweli, J Dilla, Common, Dipset, DMX, Nas, Biggie and every single Bad Boy Records artist. It was Tribe in particular who stole my heart. To put my affection and fanaticism for the Linden Boulevard Queens rap group in perspective, I had about a dozen friends call or text me the day Malik “Phifie Dawg” Taylor of A Tribe Called Quest died. Anyone who is close to me knows what Tribe has meant for my life. They grew my love for hip hop and to them I am forever grateful. Not having an LA artist to call my own was tough. I love hip hop and I love my city, but no one's story spoke to me. I wanted a voice of my generation from my area. Then in 2010, while a freshman at the University of California Berkeley, friends of mine kept suggesting I listen to this rapper who went by K.Dot. I was a stereotypical backpack hip hop fan straight out of the movie Brown Sugar, I wanted to save hip hop. If the artist wasn't from the golden era of the 90's, I didn't want to listen. But everyone I knew and trusted insisted that this guy named Kendrick was my vibe. I finally acquiesced and downloaded O(verly) D(edicated) and never looked back. On the night of March 23rd, Kendrick Lamar released "The Heart Pt. 4", a new edition to a series of songs he’s been doing since 2010. The song comprises of 3 different beats and varies from "introspective" Kendrick, "diss track" Kendrick, to "spazz out" Kendrick, accompanied by all his different voices; just like a true Gemini. At the end of the track, Lamar warns every other rapper that they have until April 7th to get ready. Right there we have an album date. Fast forward to March 30th, exactly one week after the surprise release of "The Heart Pt. 4", Kendrick releases a video for a track called “Humble”. I was driving to Sacramento to speak at an elementary school when the video was released. I spent 30 minutes of that drive not paying much attention to the Golden State 5 Freeway, but watching the video over and over again. It was perfect. "Humble" is Kendrick in ultimate flex mode. He takes fellow rapper Big Sean’s own ad-lib to eviscerate him and tells us that the song he released the previous week ("The Heart Pt. 4") was simply his left stroke, a warm up, that went viral. The internet lost its collective mind. "Humble" generated half a million views in about 90 minutes. Between YouTube, Facebook, Twitter, Instagram, SnapChat, we were salivating for this album. So here we are, Kendrick Lamar Day. We have been gifted with Damn. on this beautiful day of April 14th 2017. I have already played this album 5 times and will surely need a couple of months to absorb and dissect all its gems before I even attempt to write about this masterpiece. In celebration of the release of Damn., let’s countdown some of K.Dot’s best songs. Disclaimer, not all of these are my favorite, or necessarily his best. I used a criteria of content, significance, mainstream popularity, cultural relevancy, and listener digestibility. A radio favorite from his major label debut and certified classic Good Kid, M.A.A.D. City, the hook is Kendrick grappling with this new level of attention. Kendrick feels the expectations and energies of those around him shifting. He needs people to know that he isn't their messiah and does not want to be idolized, but is simply a sinning man who needs his alone time. The ability to tap into his truest internal emotions is something he holds dearly and does not want it to fade away. He refuses to play a role, chasing a false image in order to reach commercial appeal. Kendrick powerfully declares, "I'ma break out, and then hide every lock, I'ma break out, and then hide every lock". Lamar lets us know early on in his super-stardom that he will not compromise or be pigeonholed into the industry's idea of what he's suppose to be as a rapper. Another single from Good Kid, M.A.A.D City, "Poetic Justice" features a rare collaboration between sometimes rivals, sometimes peers, Kendrick and Drake. 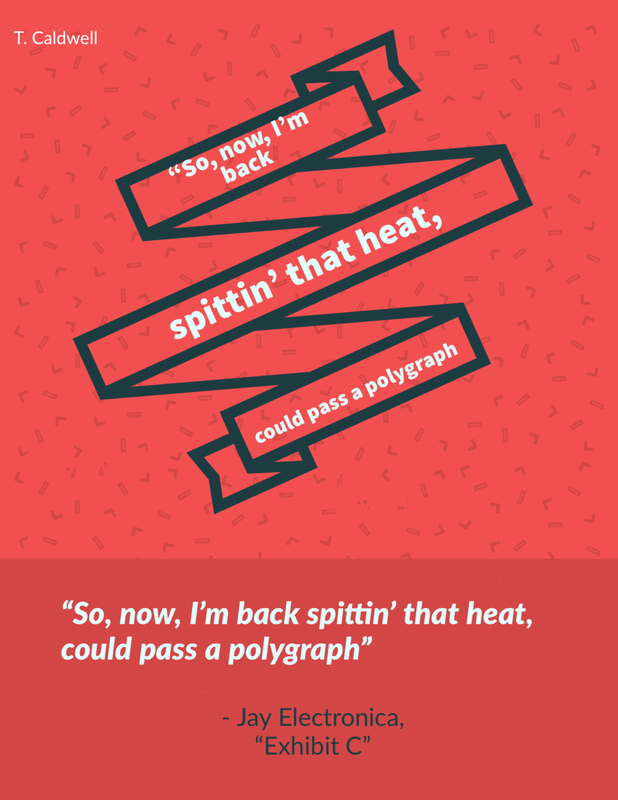 The song was inspired by the John Singleton directed film, Poetic Justice, starring Janet Jackson and Tupac. 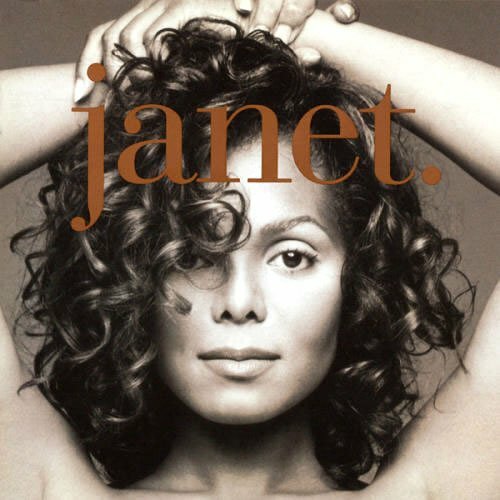 Janet's intimate and sultry "Anytime, Anyplace" is used as a sample. "Poetic Justice" mirrors a spoken word piece in that it's detailed, compassionate, yet urgent. Kendrick's edifying words are used to tell this woman just how worthy she is. He understands the power of truth and empathy held in his pen. The significance of this song is deeper than its radio appeal. Released in the middle of 2015 post-Ferguson uprising, the song became the unifying and uplifting chant for Black Lives Matter protests across the country. Over Jazz and Funk beats, Kendrick is battling his inner-demons on To Pimp a Butterfly. Ending a majority of the songs with the line, "I remembered you was conflicted, misusing your influence". Kendrick is fighting a spiritual battle between pursing his career, and wanting to do more while keeping his sanity. More acclaim, more money, yet none of those material comforts can ward off the depression and pain he feels watching the struggles of his people. It was fitting that as weary protestors took to the streets in solidarity with victims and their families to demand justice for the killing of black bodies at the hands of public servants, the words "we gon' be alright!" became the rallying cry. 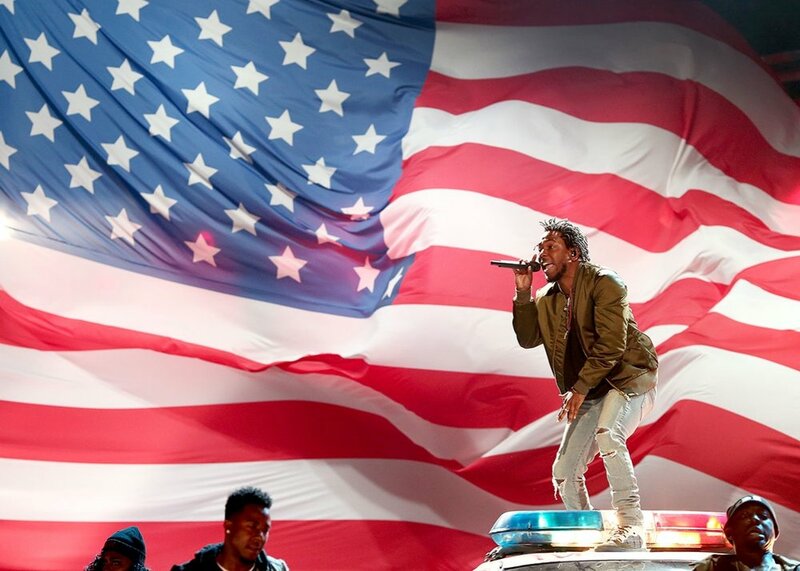 Amongst the militarized police tactics used against the bodies of peaceful protesters; violent arrests, painful tear gas, dehumanizing speech and treatment, Kendrick's "Alright" offered a bit of hope and strength for the freedom fighters. Section. 80 is centered around the damage done to the babies of the Ronald Reagan Era. "A.D.H.D." in particular focuses on the self-medication these youth have been conditioned to rely on. How do you relieve yourself of the pains of systematic oppression that plague your community? Resources are either inadequate or non-existent, you're painted as nothing more than a problem, you're met with daily trauma as the people in power feel they must institutionally "fix" you. Eventually you are left feeling emotionally and physically empty. So you engage in any behavior that reminds you that you're alive; the distractions are numerous, the solutions aren't available, you can't focus. Everything you crave are a means to detract and distract from the problems that leave you feeling hopeless. "The Heart Pt 2". is Kendrick's most emotionally raw recording and my personal favorite. He seemingly raps the 5 minute track in one breath. It literally ends with him gasping for air as he urgently and emphatically chokes out his final verse. Touching on an array of topics ranging from his impending career ascent, the fear in recognizing there's no limit on how great he can be, survivor's remorse, and his desire to stay connected to those in the struggle; he understands that people are facing very real life and death decisions everyday. "The Heart Pt 2." is Kendrick passionately prophesying that his artistry is not only going to change rap, but change the world around him. He told us seven years ago that he will not be influenced or swayed by the powers that be: "I pray these bars get farther than Compton, and if our record never break, I still won't break my promise, I promise to keep it honest". You have more than kept your promise, Kenny. "Rigamortis" is what I call quintessential “spazz-out” Kendrick. "Spazz-out" Kendrick transcends into this intentional yet chaotic stream of conscious rapping style. His wordplay, metaphors, entendres, and punch lines hit like a flurry of sharp jabs, hooks and uppercuts. Absent of a chorus, Kendrick increases the speed of his verbal assault as each verse progresses. You wonder where he gets the lung power to execute this piece as he rarely takes a breathe. All the while, the improvisational jazz instrumentation grows its pace like a freight train with no intention of stopping. The listener's adrenaline and pulse increase with the track as Kendrick Lamar warns them that their favorite rapper will have an ill awaited fate if they dare to duel. The songs title comes from the Latin term Rigor Mortis, meaning “stiffness of death”; a condition that occurs a few hours after death when chemicals are depleted from muscle fibers. By the end of the song, Kendrick has in fact demolished everything in his path and respectfully ends with “amen”. The New Orleans style funeral procession jazz horns in the background are perfectly fitting. “Momma” is my favorite song on To Pimp a Butterfly. Following the theme of the album, Kendrick continues to confront the source of imbalance in his life repeating to himself, “I remembered you was conflicted, misusing your influence, sometimes I did the same, abusing my power, full of resentment, resentment that turned into a deep depression”. The forthright Gemini has a man in the mirror moment acknowledging that all of his talent, success and achievements still don’t match the securities of his upbringing which bring him ultimate peace. While Kendrick theorizes and self-analyzes, he goes through a checklist of all the things he knows, only to circle back and realize he knows nothing. It’s not until he returns home to God, his city, his family, his people, that he sees real truth. Poppin’ bottles, puttin’ supermodels in the cab, proof. 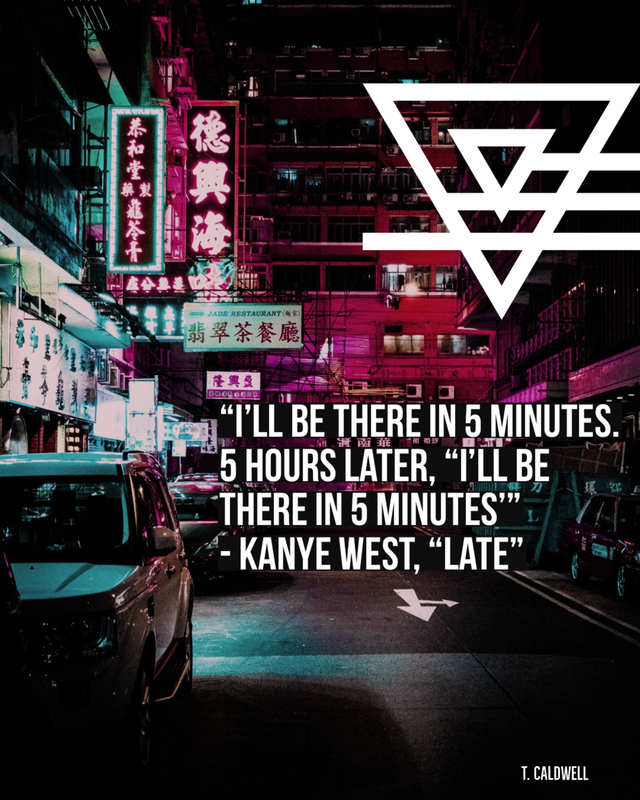 These are lyrics from Jay-Z and Kanye West's "Otis", the first single off their 2011 collaborative album Watch The Throne. And if you listen to any radio station that plays rap, you will here a dozen more songs that go something along those same lines. I love rap. I enjoy the hard hitting beats, the storytelling, the clever metaphors and wordplay, the uniqueness of rappers' voice and dialects (unless you're Desiigner), all of it. Rap is a sport and I'm drawn to its competitiveness. The stakes are high in a genre centered around knowing who's better. Rappers have to be hyper aggressive, tough, and self-confident in order to have a chance at "making it". The egotism rappers exude is more than fun showmanship. Their brash is an attempt to immortalize and elevate themselves to legendary status. The ante is constantly being raised on who can be the most outlandish, flagrant and braggadocios. One of the boldest examples of this is on 2013's Yeezus. On a song titled, "I Am a God", Kanye West literally gives God a feature credit. I mean that is next level narcissism right there and I love it. Donna, Ulanda (WHAT?!) Tawana, and Wanda"
For fans, it can be hard to listen to music that is so far from your life. How many of us are throwing our Rollies in the sky, popping bottles in VIP, taking PJs (private jets) around the world and courting anyone we desire? We're constantly being reminded that we aren't where they are, doing what they're doing as fresh and cool as them. Rappers and their god like personas can create a distance between us and them. But good music is for the people, to unify us through shared experiences we can all relate to. The pictures these artists paint aren't real life. They are fun stories that take us to a fantasy land. The world isn't a 90's Puff Daddy music video; these guys have mo' money and mo' problems too. 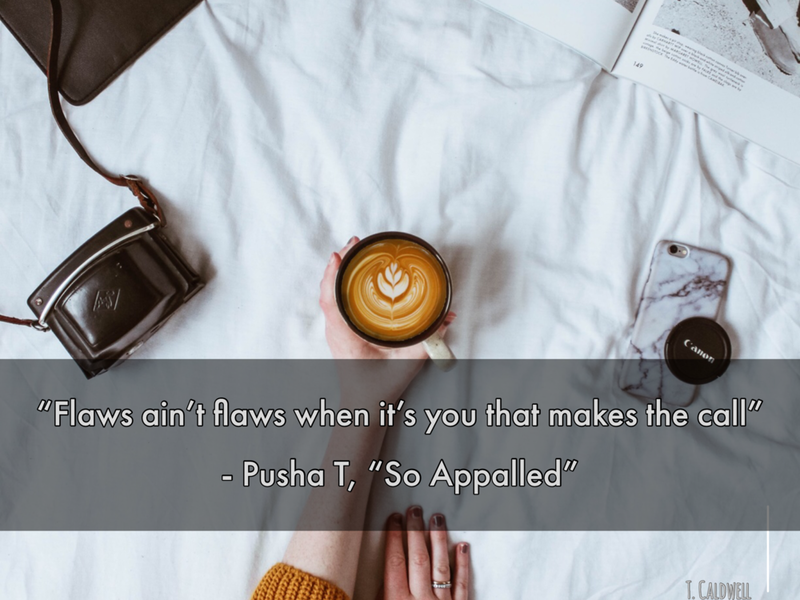 Even Yeezy comes clean in his classic song "All Falls Down" saying, "we all self-conscious I'm just the first to admit"; that's real, that's keeping it "one hunnid". Rappers should feel free and safe enough to talk about their disappointments, their heartbreaks, their desires to change their circumstances. So let's give praise to the rappers who aren't "ballin", who don't get the dream girl, and who aren't the big man on their block. Pharcyde's "Passin' Me By", Skee-Lo's "I Wish", and Biz Markie's "Just a Friend" are classic hip hop songs most casual listeners have heard at least once. 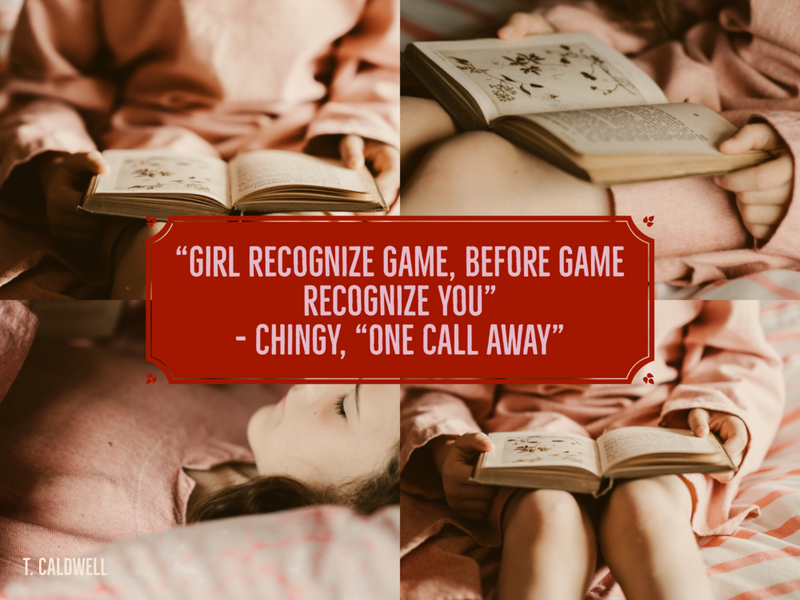 While recognized for their mesmeric beats, catchy hooks, and savy rhyme schemes, rarely do people acknowledge the relatability of the stories told. Each rapper presents scenarios many of us have been in, but are too embarrassed to share. This is a unique gift and responsibility of true artists; to beautifully express the mundane, the normal, the commonalities with which we're all familiar. 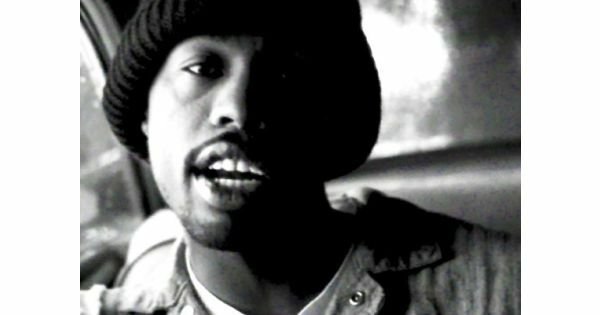 1) The Pharcyde's "Passin' Me By"
"Passin Me By" has the quintessential 90's boom bap sound to methodically nod your head to. Hailing from my hometown of Los Angeles, California, Bootie Brown, SlimKid3, Imani, and Fatlip's articulated cadences make rhyming along easy. When I first heard this song at the age of 11, I ran home, printed out the lyrics, and proceeded to memorize every word. It is one of my favorite songs of all time and I still know every line verbatim. Although the chorus clearly repeats "she keeps on passin' me by", it wasn't until recently at the age of 25 that I realized just how sad their love lives were. All of their crushes really do pass them by. The last verse in particular illustrates the overall mood of the song and plight of these fellows. It's here Fatlip puts his heart on the track while rapping about the dopest Ethiopian woman who simply won't give him the time of day. Poetry. We've all experienced rejection in some form. But it's not often that a rapper admits to being overlooked and disregarded by a woman. Already, his vulnerability is tugging at my heart strings. This woman is the apple of Fatlip's eye. He calls her his little princess, not some b---ch or h-- . Describing a woman you're fond of without using derogatory terms always gets you a win in my book. Fatlip is so unassuming in his pursuit of this woman that in order to make this young woman aware of his existence he has to write her a letter. Compared to today's suitors who simply slide in your DMs or swipe you to the right on some dating app, Fatlip's efforts are impressive. 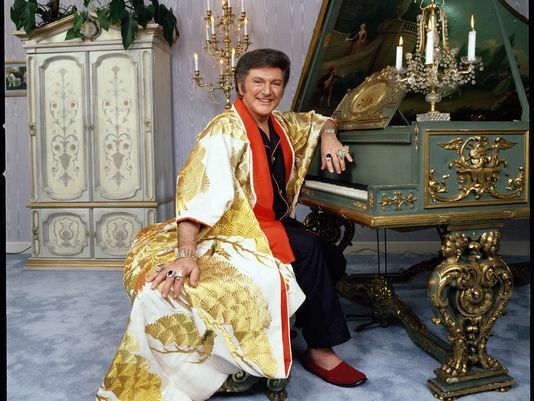 His salutations are chivalrous and polite harmonizing, "my dear my dear my dear". To be honest, I'd probably marry the first person who wrote me a letter. While writing the letter Fatlip gets introspective in his admiration for this woman. He admits that he hasn't been able to work up the nerve to approach her and calls himself a wimp and simp. These are fighting words in the hip hop community. Urban Dictionary defines a simp as "a man that puts himself in a subservient/submissive position under women in hopes of winning them over." Unsubscribing to toxic masculinity, Fatlip clearly does not care what you or I think about his emotions. He knows what his heart wants. Finally, Fatlip builds up the courage to send off the letter with a "the one who loves you dearly" farewell. 3 longs days pass and what happens? The letter is returned to sender. As a listener all you can do is echo Fatlip's final line; a defeated and breathy "damn!". Sometimes you can't win for losing. So how am I gonna compete with that? Intentionally or unintentionally, Skee-Lo is breaking black male stereotypes by airing out his perceived shortcomings; he's not tall and he's not good at basketball. Meanwhile, Ice Cube was still trying to convince us that he registered a triple double in a pick-up game. There is a historical symbiotic relationship between basketball and hip-hop. Every rapper wants to be a hooper and every hooper wants to be a rapper. This is a biblical fact. Fortunately and unfortunately, many have dabbled in both. In this case, the undersized Skee-Lo is not a basketball playing, hip hop rhyming double threat. And he believes these perceived limitations are holding him back from being a cooler, more prosperous guy. So doing what he can with what he has, he brilliantly creates a hit rapping about the things he wishes he had. Most rap songs sound something like "Yo, I got this, yea I got that, of course I got her, and I even got way more of that". Skee-Lo does the exact opposite, saying "Yo, I wish I had height, I wish I had basketball skills, I really wish I had a girl and a '64 impala, I'll even take a rabbit in a hat". This would have been the perfect time for Shaquille O'Neal as Kazaam the genie to appear. I'm don't know if Skee-Lo ever got his wishes, but his song sold over 600,000 copies, went gold, and was nominated for Best Rap Solo performance at the 1996 Grammy's. He lost to Coolio's "Gangsta Paradise", but he was so close. 3) Biz Markie "Just a Friend"
Yo, could you tell me where is door three? Oh, snap! Guess what I saw? This is what us young people call "getting played". Biz Markie's "Just a Friend" is a great karaoke jam. Released in 1989, before rappers were singing hooks and choruses, it's a 80's hip hop love ballad that I will always choose over LL Cool J's "I need love" which has aged terribly. No matter where you go in the country, most people join along when they hear Biz belt out, "Ohhh babyyy youuuu! Youu got what I neeeeeed!". A contrast from the tough guy role rappers portray, Biz's playfulness makes this one of the most lighthearted song's in hip hop. His infectious personality and fun rap-a-long style gains the affection of fans. This makes his predicament even more devastating. We love Biz, we are rooting for Biz, we want Biz to win and get the girl. Being the consummate gentleman, Biz makes a trip to surprise his lady friend while she's at college. He probably has a nice romantic weekend all planned out for him and his lady; beat boxing, taking long walks in the park, making mixtapes on his boombox. You can visualize the whole thing. Yet, to his shock, he finds the lady he's been dating kissing another guy. We don't know the dynamics of Biz and this woman's relationship, but he's soundly invested. And while she has the right to do what she pleases without his permission, communication could have definitely been clearer. Biz thought his lady was hanging with a platonic friend. She thought Biz was just another friend. You can't help but empathize with the guy. After such a tragic ordeal, you wonder if Biz developed serious trust issues. But, as a consolation prize, Biz's misfortune has made him a fortune. This hit is still popular 30 years later and has gone on to influence music today. Taking Biz's advice, Chris Brown would go on to make an anthem reminding us that "these h--- ain't loyal". Hopefully rap will continue to evolve and become more comfortable being self deprecating and despondent. Talking about our pain is a human right that helps us lead healthier lives. We all take L's, but what's most important is that you keep showing up for the game. Law of averages says that you're eventually going to win. Keep swinging.